Before shopping for a new home, people often create a “wish list” of the features they desire most. That’s a good way to ensure you choose a home that best fits your needs and desires. For example, you might want an extra bedroom for guests, ample space for a home office, a local playground for the kids, and so forth. However, many buyers don’t make their lists complete enough. You might find a home with the extra bedroom and nearby playground you want, only to realize, too late, that your commute to work becomes twice as long. You missed the importance of the commute because it wasn’t on your list. Ouch! When you make your wish list, don’t be afraid to dream big. You might not be able to find a home that includes everything you desire, but you may be surprised by just how close you can get. Distances to places you visit regularly – work, schools, running trails, restaurants, entertainment venues, shopping. Specific home features – a backyard tree, large closets, a fireplace, a two-car garage, a beautiful view. Characteristics of the area – safety, sidewalks, nearby public transit, parks, playgrounds. A complete list helps you make a better decision about which homes to consider. It helps you balance the positives — “I love the large kitchen with the marble countertops” — with the negatives — “The bathroom off the master bedroom is small” — to ultimately make the best buying decision. 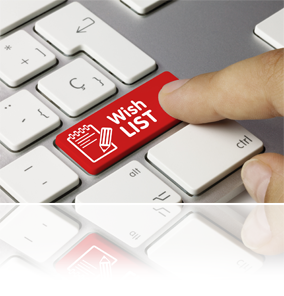 Also remember to take your list with you when shopping for a new home. Use it as a checklist or as a way to organize notes. Ultimately it will make it easier to shortlist homes, compare them, and determine when you’re ready to submit an offer.